Warning: CPU Mining isn't recommended as the likeliness of mining a block with it is very low. Try GPU mining instead. Make sure that you have already setup a wallet and that your network is running correctly! You can check out the Windows Wallet Guide to learn more. First you will need to download the CPU miner files here. Extract the files in your installation folder (if you have followed the wallet guides it should be C:\Garlic\). This miner uses a different system for different types of CPUs. Follow the section for your own CPU. If you own an Intel i7, the instructions are different than for other Intel CPUs. Because Pool Mining is strongly recommended, we will go with that. You can learn more about the difference between Solo And Pool Mining here. If you prefer to Solo Mine, you can skip to that section here. 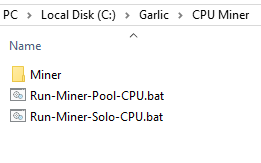 Edit the Run-Miner-Pool-CPU.bat file (Right Click > Edit) and change the pool (POOL) to whichever pool. Then change the address (ADDRESS) to whatever you Garlicoin address is. This image might be outdated, do not try to copy its content. Use the files given instead. You can now start mining with a Pool. Simply run your Run-Miner-Pool-CPU.bat and you should be good to go. If the console returns something like [2018-01-06 23:00:23] accepted: 4/4 (diff 0.000), 82.67 kH/s yes! then you have gotten an accepted share! If you wish to Solo Mine instead of with a Pool (you can learn more about the difference here), then follow these steps. As setup in the wallet guide, make sure that you have your network running. (You can do so by running Run-Network.bat if you haven't already). Edit the Run-Miner-Solo-CPU.bat file (Right Click > Edit), and this time, only change the address (ADDRESS, the one after --coinbase-addr=) to your address. Since there is no pool, you do not need to change anything else in the file. You can now solo mine. Simply run your Run-Miner-Solo-CPU.bat and you should be good to go. If the console returns something like [2018-01-06 23:00:23] accepted: 4/4 (diff 0.000), 82.67 kH/s yes! then you have mined a block! Mac guides are currently not available. If you wish to contribute to this site, please create a pull request here. For now, you can follow this guide originally by @Vilsol#2060, which should get you going (although it is not as detailed as a normal guide). Clone from the project Github repo into a directory of your choice. Following the instructions in the project's README, run ./build.sh in the new directory, and install any prerequisites as specified by your environment. You're should now see your hashrate and, eventually, confirmed blocks.